Neighbourhood magazines are enjoying a renaissance, according to a recent panel talk co-hosted by magazine store MagCulture and The Hoxton last week, but are they sustainable, scalable and truly inclusive? Editors of the Courier London, South East London Journal (SELJ), Time Out City Guides and Village Raw made up a panel of speakers who shared their experiences and insights on running neighbourhood magazines. The demise of the local daily newspaper has left a gap in the market that is being filled the monthly or quarterly print magazines, explains Time Out’s City Life Editor, James Manning. These magazines may not cover court reporting or council meetings, but they do speak to communities on a cultural level, whether by bringing people together to enjoy local food, arts and culture, or by shining a light on the culture and identity of communities. Connecting people was the motivation for both Jessica Miller, editor of South East London Journal, and Luciane Pisani of Village Raw to launch their magazines. Miller launched the quarterly South East London Journal five years ago. ‘It was an exciting time of renewal and regeneration in South London and yet there was no publication covering the local area. I wanted to connect the dots’. Similarly, Pisani, who launched Village Raw a year ago, wanted to connect a cluster of neighbourhoods in North London. Her publication, which covers Stroud Green, Muswell Hill and East Finchley, focuses on supporting independent high street shop owners and looking at global issues on a local level, encouraging local residents to place themselves at the heart of a network of neighbourhoods. Both are examples of publications that are started by local residents who love their neighbourhoods and feel there is a gap in the media market in their local area. James Manning, Time Out City Life Editor, explains that Time Out, as a city-wide publication, cannot bring to bear the level of detail needed to be able to produce neighbourhood content that would satisfy ‘insiders’. ‘Our guides are for outsiders looking in, whereas neighbourhood magazines are publications for insiders writing to an audience who like to know who used to be in the shop before it was a butchers’. It would be hard for any city-wide publication to cover all of London’s neighbourhoods with insider-level detail. London has grown as a collection of hamlets and as it expands ever outwards so it increases the number of its neighbourhoods. When Time Out conducted a study of city neighbourhoods, it transpired that Paris has 70 neighbourhoods, New York had 169 and London has a staggering 460. ‘No man is an island’ is part of the British psyche it seems, for we are evidently a nation of village-makers who instinctively know that we need community to thrive. The community-centred content is claimed to be one reason why print is favoured by these neighbourhood magazine editors. ‘The print magazine is a break from the screen, which is something people yearn for when they leave work and return home to their local neighbourhood’ said Courier London’s Isabel Warby. ‘Also, people stumble across it more easily than online’. But these magazines are all a far cry from the advertising-heavy free glossies that have previously defined neighbourhood magazines. These are artistic rather than flagrantly ‘luxe’, printed on recycled, matt paper, with acres of off-white space and Instagramable images. The message is clear – just because this is a ‘community magazine’ that doesn’t mean it can’t be a thing of beauty. It is the beauty of the magazines that can attract accusations of these pretty periodicals being agents of gentrification. Surely this aspirational, tasteful format is exclusive, appealing primarily to readers from socio-economic backgrounds that can afford to appreciate the art and beauty of life? Pisani says the key is to be as grassroots as possible. ‘We want to be as inclusive and accessible as possible so our approach is completely different to mainstream magazines’ explains Pisani, ‘We started with a Kickstarter campaign to get the support of local residents and, because we don’t do display ads, we are free to cover all types of businesses not just ones paying to be featured.’ Pisani marks every issue with a launch event and the mix of people attending, she says, is a testimony to their diverse readership. ‘It’s presumptuous to think that just because you come from a certain type of background, you can’t appreciate something beautiful’ says Miller. ‘My issues are themed by subjects that have appeal across all ages, genders, classes and income brackets.’ Her most recent issue is themed on dogs, and previous ones have included swimming, cycling and architecture. Millers topic-themed issues don’t include time-sensitive news stories, allowing Miller to produce magazines with features that will be as relevant in ten years as they are today. These ‘evergreen’ publications become collectable items with back-issues selling for £5. ‘There isn’t one magazine that is read by everyone’ points out Manning. ‘They are all niche.’ Time Out, explains Manning, tries to offer as many viewpoints as possible so its not homogenous, mono-cultural reading experience. ‘We try to cover the existing communities as well as the incomers’ he says, ‘That’s how London works – cheek by jowl’. While these are print-first publications, digital is not ignored. Time Out dominates online for most short-tail to mid-tail ‘city guide’ search terms thanks to the sheer volume of its well optimised digital outputs, driving its sales of online advertising and listings. SELJ focuses primarily on print but publishes each issue in PDF format online, as well as bonus content. Village Raw publishes most of its editorial content online as well as in print, and uses the website to house its film content, offering an additional insight into its content creation that plays ideally to the online viewing experience. When Miller launched SELJ five years ago gathering news from businesses, let alone advertising revenue, was an uphill struggle. However the regeneration of neighbourhoods in south-east London in recent years means the landscape of local high streets is transforming from being one of struggling sole traders to larger, better resourced nationals. Miller is now inundated with press releases from in-house PRs and five years on SELJ is healthily packed with small ads. While this would not be a revenue model that could be sustained in poorer neighbourhoods, who lack the requisite art galleries, yoga studios and garden designers, Miller proves that traditional advertising model is still viable where local economies are thriving. Pisari’s Village Raw, only one year old, eschews display advertising in preference for native advertising. Each issue is funded by three or four content partners fitting the community criteria of the publication – a co-working space, an arts hub and the re-opening of a local theatre. Harder to come by, the benefit of native content is a seamless reading experience, everything delivered as a long-form feature. Given London has 460 neighbourhoods to cover, can we hope to have contemporary community magazine in every city hamlet? 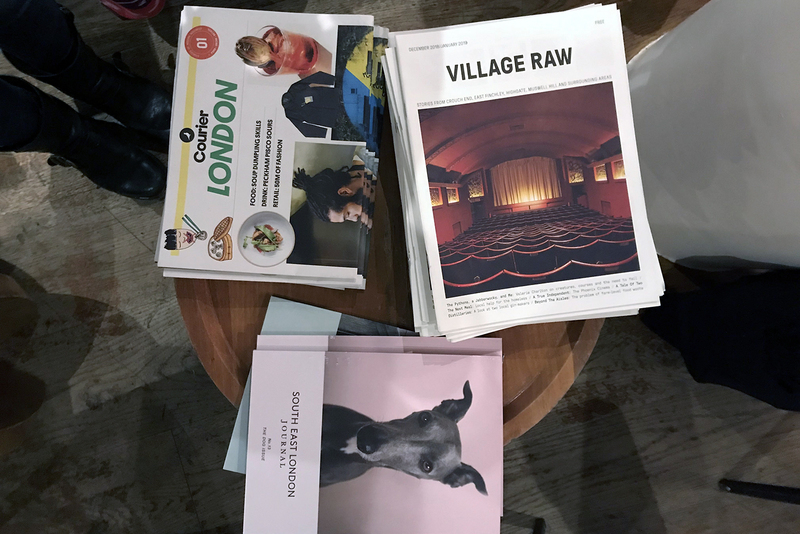 Village Raw and SELJ prove that the appetite for high-quality local journalism is there, which is born out too by Social Street’s flagship online neighbourhood magazine, Roman Road LDN, that attracted 100,000 online unique readers in its first year. These publishers also prove that, at least in a thriving local economy, the advertising model is still there. Despite the online clamour for attention and the proliferation on free publications, advertisers want to associate themselves with trusted editorial content. Despite this, the local neighbourhood magazine, or at least the sector that was represented at MagCulture, has yet to evolve from personal passion project to scalable business. Village Raw is run by a duo, SELJ by a single person. ‘Working from home isn’t conducive to taking on staff’ laughs Miller. ‘The template is replicable but without resources I would need to partner with another organisation to open an additional neighbourhood title’. The challenge will be finding editors as passionate and talented as the pioneer women behind these titles to be able to do justice to each community.